Leinster have qualified for the Heineken Champions Cup quarter-finals thanks to Edinburgh's win over Montpellier, a result that moves Ulster closer to the last eight before today's clash with Leicester Tigers. The Scottish side's 19-10 win at Murrayfield secured Pool 5 and eliminated the French side, but it means Munster's hopes of securing a home quarter-final have been almost certainly dashed. Johann van Graan's side must beat Exeter Chiefs (5.30) to top their pool and hope for a highly unlikely sequence of results to have any chance of being back in Limerick in the next round. It is far more likely that they will face an away trip to the Scottish capital at the end of March to take on their fellow Guinness PRO14 side Edinburgh. That's provided they do enough against an Exeter side who are themselves still in the hunt. Four points behind their hosts, the English team need to beat Munster and deny their hosts a bonus point to leapfrog them into the last eight. 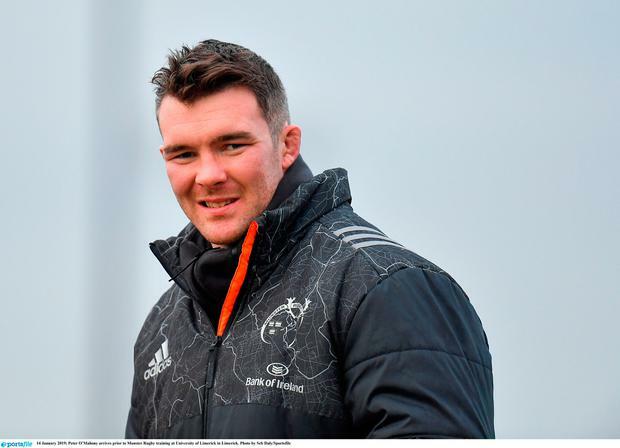 Munster will be banking on their recent form, European experience and the surprise presence of their captain Peter O'Mahony in their starting XV to see them through. Montpellier's defeat means Ulster have one foot in the quarter-final but they will likely need at least a losing bonus point against Geordan Murphy's Tigers at Welford Road to make sure of their place. Ireland second-row Iain Henderson is back in the starting line-up having made a quicker-than-expected return from thumb surgery. A change to tournament rules means the top two seeds will be guaranteed home country advantage in the semi-finals and Saracens and Racing 92 can secure that status if they can overcome Glasgow Warriors and Scarlets at home. However, if they slip up, Leinster will be able to pounce when they face Wasps at the Ricoh Arena tomorrow (3.15) as they welcome Robbie Henshaw and Devin Toner back to the team and Seán O'Brien to their bench. In last night's other Champions Cup game, Toulon edged an entertaining but meaningless pool five clash at Newcastle 27-24. Leinster out-half Johnny Sexton says that the Champions Cup final against Saracens will be the 'biggest battle' of his career. Brendan Fanning If you were scripting the Champions Cup this season then the last scene would involve Leinster, the defending champions, against Saracens, back-to-back winners in 2016 and 2017.